We’re happy to announce that a new major Techinline version, 2.1.0, is set to be released tomorrow. Most importantly, this release will contain the long-awaited and desired “Restart as a Service” feature. 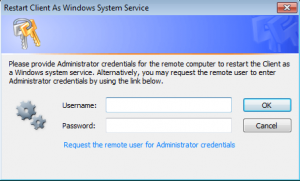 Restart As A Service: When the Client application has been launched without full administrator permissions, the Expert is now offered the option to restart the Client application as a Windows System Service. After the restart, the Expert receives full control of all UAC dialogs on the remote computer. The administrator credentials required for this operation may now be provided by either the Expert or Client. 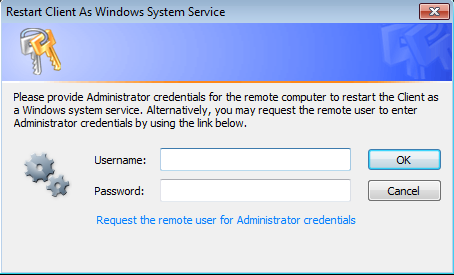 This feature should prove to be useful in situations where administrator credentials may not be shared with the remote Client. Please note that the “Restart As A Service” panel will automatically appear on the Expert’s Techinline interface only when the remote Client is running on a UAC-enabled Operating System (Windows Vista or later). In an overwhelming majority of cases, this panel WILL NOT appear because Techinline has already been launched As a Service (therefore there’s no need to restart as a service). This release will serve as a major stepping stone to further enhancing and expanding Techinline’s overall functionality. We have several other important releases planned for the coming months, and therefore I’m confident that all Techinline users will continue to draw increased value from our improvements and newly added functionality as the year unfolds. Please do not hesitate to share your thoughts and feedback regarding our latest version by contacting Techinline’s Sales or Support staff. Techinline's Major 3.0 Version Release: Unattended Access is Now Available!